Officer Caraway, you served for thirty years, unselfishly putting your life in danger each and every day. Our good Lord will reward you abundantly. May He grant you His peace and immerse you and your loved ones in His Divine Mercy. Rest in peace, good and faithful servant. To the Family of Terrence Carraway I wish to extend my sincere condolences for your loss. Death is truly an enemy especially when one has not lived out their days. I have found comfort in Jesus Christ promise at John 5:28, 29 “Do not marvel at this, the hour is coming when all those in the memorial tombs will hear his voice and come out. Those who did good things to a resurrection of life..” Thus we have the sure hope of being reunited with those we love who have fallen asleep in death. God bless you Officer Carraway. Praying for your family. Thank you for your service . Your sacrifice is not in vain, for you will be remembered. On behalf of POINT 27, we would like to offer condolences for Police Officer Terrence Carraway. Please know we are eternally grateful for Terrence’s service and his ultimate sacrifice. 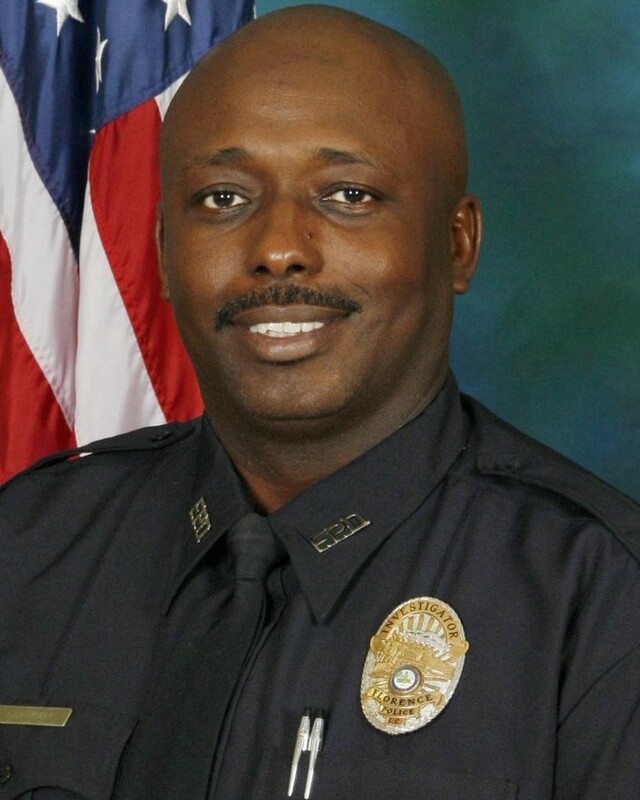 To honor Officer Carraway, POINT 27 sent Thin Blue Line Dog Tag Necklaces, engraved with “Blessed are the Peacemakers for they will be called children of God” Matthew 5:9, to the Florence Police Department’s Chief, for Terrence’s partner and fellow officers. POINT 27 sent Folded Flag Necklaces engraved with “Greater Love has no one than this; than to lay down one’s life for one’s friend” John 15:13 for Officer Carraway’s family. The National Police Wives Association would like to extend their heartfelt prayers to the family of Officer Carraway and the Florence Police Department during this time. Thank you, Officer Carraway, for your service. Rest in peace Sgt Carraway, my sincere condolences to your family and to your department. God speed as you now patrol the streets of gold. Your ultimate sacrifice will not be forgotten. A Protector, a Guardian, and True Hero for thirty years. Please watch over us, your Blue Brothers and Blue Sisters, while we continue to serve with pride and dignity. You made the ultimate sacrifice Sir. The Thin Blue Line continues, and we will take it from here. Officer Carraway, you were gunned down by a coward and you died a hero. How tragic that you had to die, when you didn't. This individual could have given up, but instead decided to take your life and the lives of other Law Enforcement Officers. So far, thank God, the others survive. You have earned a special place in Heaven and yet, I know in my heart you will be right here, watching over all, both family and colleagues alike and so long as those who know and love you best keep you in their hearts and minds, you will never truly be far from them. Rest in Peace Officer Carraway. My sympathies to your family, colleagues and friends. Thank you for your BRAVERY and your willingness to sacrifice yourself to protect and save your Fellow Officers. You will be forever a True HERO! Prayers for the Family, Friends, and Fellow Officers. May God bless you and your family, you paid the ultimate sacrifice. May you rest in peace my brother in blue. RIP my brother. It just makes no sense for something like this to take this brave man's life.